Neurology is a medical specialty dealing with disorders and diseases of the nervous system. In the past the term has been used more generally for the study of the nervous system; the term itself comes from the Greek νεῦρον, neuron, for "nerve cell" and the suffix -λογία for "study of." However, today the term neuroscience is employed for the larger field that encompasses the scientific study of the nervous system, while neurology is the branch related to medicine. Both neurology and neuroscience are interdisciplinary fields. Neurology deals with the diagnosis and treatment of all categories of disease and disorders involving the central and peripheral nervous system, including such neurological conditions as Alzheimer's disease, seizures, stroke, paralysis, coma, epilepsy, meningitis, encephalitis, multiple sclerosis, herpes simplex virus 2, amnesia, Parkinson's disease, paraplegia, hearing loss, and various infections and tumors of the nervous system. A neurologist is a physician specializing in neurology and trained to investigate, diagnose, and treat neurological disorders. Neurologists also may be involved in clinical research, and clinical trials, as well as basic research and translational research (making findings from basic science useful for practical applications that enhance human health and well-being). Some neurologists specialize in certain parts of the nervous system or in specific procedures. For example, clinical neurophysiologists specialize in the use of electrodiagnostic techniques (EEG and EMG) in order to diagnose certain neurological disorders. Neurosurgery is a specialty distinct from neurology and involves a different training path; neurosurgery emphasizes the surgical treatment of neurological disorders. More than 1000 disorders and diseases of the human nervous system have been delineated, affecting up to one billion people worldwide and trillions of dollars in cost. Although the human brain is the most complex living structure known, neurologists have been making great strides in tackling those conditions that fall within their purview. Neurons often have extensive networks of dendrites, which receive synaptic connections. 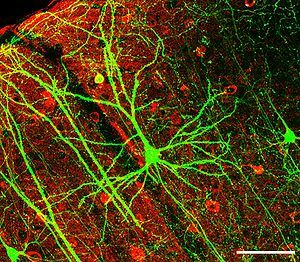 Shown is a pyramidal neuron from the hippocampus, stained for green fluorescent protein. The nervous system is the network of specialized cells, tissues, and organs in a multicellular animal that coordinates the body's interaction with the environment, including sensing internal and external stimuli, monitoring the organs, coordinating the activity of muscles, initiating actions, and regulating behavior. 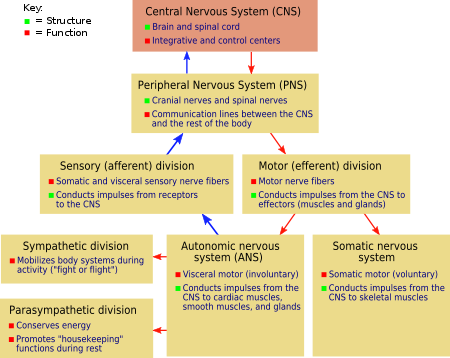 The vertebrate nervous system is divided into the central nervous system (CNS), comprising the brain and spinal cord, and the peripheral nervous system (PNS), consisting of all the nerves and neurons that reside or extend outside the central nervous system, such as to serve the limbs and organs. The peripheral nervous system, in turn, is commonly divided into two subsystems, the somatic nervous system and the autonomic nervous system. The interdisciplinary field in science that is organized around the study of the nervous system is termed neuroscience. This field encompasses the scientific study of the structure, function, and development of nervous systems, normal and abnormal variants, ranging from the simple systems of such invertebrates as platyhelminthes and nematodes to the complex systems of vertebrates like human beings. Among the components that are studied are the brain, dorsal and ventral nerve cords, spinal cord, nerves, muscles, neurons (nerve cells), central nervous system, peripheral nervous system, neurotransmitters, sense organs and senses (such as taste and touch), and so forth. Diagram showing the major divisions of the vertebrate nervous system. Neurology is the medical discipline dealing with neurological disorders (disorders of the nervous system). To be specific, neurology deals with the diagnosis and treatment of all categories of disease and disorders involving the central and peripheral nervous system, as well as related symptoms (e.g., back pain), signs (e.g., aphasia), and syndromes (e.g., Aicardi syndrome). The term neurology was once used in a synonymous way with the current definition of neuroscience. For example, MaGill's Medical Guide (2008) defines neurology as "the study of the nervous system" and "the study of the structure and function of the nervous system" (Hollar 2008). However, today neurology is limited to the medical specialty dealing with disorders and diseases of the nervous system. As such, it can be seen as a branch of neuroscience. It also can be seen as part of clinical neuroscience, along with psychiatry and many allied health professions such as speech-language pathology. Psychiatry is the medical specialty that works with the disorders of the mind—which include various affective, behavioral, cognitive, and perceptual disorders. Neurology has a long history. For example, the Edwin Smith Papyrus, or Edwin Smith Surgical Papyrus, is a preserved medical document from ancient Egypt. It traces to about the sixteenth to seventeenth century B.C.E. but actually is the only surviving copy of part of a much older treatise from about 3000 to 2500 B.C.E. It contains the first known descriptions of the cranial sutures, the meninges, the external surface of the brain, the cerebrospinal fluid, and the intracranial pulsations (Wilkins 1964). It provided evidence the ancient Egyptians had some knowledge about symptoms of brain damage (Mohamed 2008), and advised immobilization for head and spinal cord injuries, which is still in practice today in the short-term treatment of some injuries. It describes results from cervical vertebral dislocation (Wilkins 1964). There are numerous human diseases and disorders within the orbit of neurology. More than 1,000 disorders of the brain and nervous system have been identified and these result in more hospitalizations and lost productivity than heart disease, cancer, or any other disease group (SFN 2013). The World Health Organization (WHO) estimated in 2007 that neurological disorders impact up to one billion people worldwide, and neurological diseases make up 11 percent of the world’s disease burden if one does not include mental health and addiction disorders (SFN 2013). The European Brain Council estimated that in 2010 neurological diseases in Europe alone cost 798 billion euros (more than one trillion dollars) a year (EBC 2011). Among conditions treated under neurology are Alzheimer's disease, seizures, paralysis, coma, Parkinson's disease, hearing loss, meningitis, encephalitis, dementia, migraine,headaches, sleep disorders, stroke, Lou Gehrig's disease, multiple sclerosis, brain tumor, brain injury, cerebral palsy, Lou Gehrig's disease, spina bifida, whiplash, and the nature of pain. In some countries, additional legal responsibilities of a neurologist may include examining unresponsive patients on life support in order to ascertain whether there is brain death when it is suspected that a patient is deceased. Neurologists frequently care for people with hereditary (genetic) diseases when the major manifestations are neurological, as is frequently the case. "A Neurologist specializes in the evaluation and treatment of all types of disease or impaired function of the brain, spinal cord, peripheral nerves, muscles and autonomic nervous system, as well as the blood vessels that relate to these structures. These disorders include: stroke, brain and spinal tumors, muscular dystrophy, headache and other pain, meningitis, encephalitis, epilepsy, Parkinson’s disease, Alzheimer’s disease and other memory disorders, multiple sclerosis and effects of systemic diseases, like high blood pressure and diabetes, on the nervous system. Neurosurgery is a distinct specialty that involves a different training path and emphasizes the treatment and correction of neurological disorders through surgery. Neurosurgeons may need to perform surgical procedures on such parts as the brain and spine, as well as individual nerves, treating such conditions as tumors, head trauma, spinal disc herniation, carpal tunnel syndrome, and cerebral hemorrhages. Often 12 or more years of study and clinical training from college on is required for someone being established as a neurologist. In the United States and Canada, neurologists are physicians who have completed postgraduate training in neurology after graduation from medical school. Neurologists complete, on average, at least 10–13 years of college education and clinical training. This training includes obtaining a four-year undergraduate degree, a medical degree (D.O. or M.D. ), which comprises an additional four years of study, and then completing a three or four-year residency in neurology. The four-year residency consists of one year of internal medicine training followed by three years of training in neurology. Some neurologists complete a one or two-year fellowship after completing a neurology residency. Sub-specialties include: brain injury medicine, clinical neurophysiology, epilepsy, hospice and palliative medicine, neurodevelopmental disabilities, neuromuscular medicine, pain medicine and sleep medicine, and vascular medicine (ABMS 2013). Many neurologists also have additional subspecialty training (fellowships) after completing their residency in one area of neurology such as stroke or vascular neurology, interventional neurology, neurosonology, epilepsy, neuromuscular, neurorehabilitation, neurodevelopment disabilities, behavioral neurology, sleep medicine, pain management, neuro immunology, clinical neurophysiology, or movement disorders. The American Board of Medical Specialties notes that "to become certified in a particular subspecialty, a physician must be Board Certified by the American Board of Psychiatry and Neurology and complete additional training as specified by the Member Board" (ABMS 2013). In the United Kingdom and Ireland, neurology is a subspecialty of general (internal) medicine. After five to nine years of medical school and a year as a pre-registration house officer (or two years on the Foundation Programme), a neurologist must pass the examination for Membership of the Royal College of Physicians (or the Irish equivalent) before completing two years of core medical training and then entering specialist training in neurology. A generation ago, some neurologists would have also spent a couple of years working in psychiatric units and obtain a Diploma in Psychological Medicine. However, this requirement has become uncommon, and, now that a basic psychiatric qualification takes three years to obtain, the requirement is no longer practical. A period of research is essential, and obtaining a higher degree aids career progression: Many found it was eased after an attachment to the Institute of Neurology at Queen Square in London. Some neurologists enter the field of rehabilitation medicine (known as physiatry in the US) to specialize in neurological rehabilitation, which may include stroke medicine as well as brain injuries. In some countries, e.g. USA and Germany, neurologists may specialize in clinical neurophysiology, the field responsible for EEG, nerve conduction studies, EMG and evoked potentials. In other countries, this is an autonomous specialty (e.g., United Kingdom, Sweden). Neurologists examine patients who have been referred to them by other physicians in both the inpatient and outpatient settings. A neurologist will begin their interaction with a patient by taking a comprehensive medical history, and then perform a physical examination focusing on evaluating the nervous system. Components of the neurological examination include assessment of the patient's cognitive function, cranial nerves, motor strength, sensation, reflexes, coordination, and gait. In some instances, neurologists may order additional diagnostic tests as part of the evaluation. Commonly employed tests in neurology include imaging studies such as computed axial tomography (CAT) scans, magnetic resonance imaging (MRI), and ultrasound of major blood vessels of the head and neck. Neurophysiologic studies, including electroencephalography (EEG), electromyography (EMG), and evoked potentials are also commonly ordered. Neurologists frequently perform lumbar punctures in order to assess characteristics of a patient's cerebrospinal fluid. Treatment options vary depending on the neurological problem. They can include everything from referring the patient to a physiotherapist, to prescribing medications, to recommending a surgical procedure. There is a great deal of overlap between neuroscience and neurology. A large number of neurologists work in academic training hospitals, where they conduct research as neuroscientists in addition to treating patients and teaching neurology to medical students. There is some overlap with other specialties, varying from country to country and even within a local geographic area. Acute head trauma is most often treated by neurosurgeons, whereas sequelae of head trauma may be treated by neurologists or specialists in rehabilitation medicine. Although stroke cases have been traditionally managed by internal medicine or hospitalists, the emergence of vascular neurology and interventional neurologists has created a demand for stroke specialists. The establishment of JCAHO certified stroke centers has increased the role of neurologists in stroke care in many primary as well as tertiary hospitals. Some cases of nervous system infectious diseases are treated by infectious disease specialists. Most cases of headache are diagnosed and treated primarily by general practitioners, at least the less severe cases. Likewise, most cases of sciatica and other mechanical radiculopathies are treated by general practitioners, though they may be referred to neurologists or a surgeon (neurosurgeons or orthopedic surgeons). Sleep disorders are also treated by pulmonologists and psychiatrists. Cerebral palsy is initially treated by pediatricians, but care may be transferred to an adult neurologist after the patient reaches a certain age. In the United Kingdom and other countries, many of the conditions encountered by older patients such as movement disorders including Parkinson's Disease, stroke, dementia or gait disorders are managed predominantly by specialists in geriatric medicine. Neurological diseases often have psychiatric manifestations, such as post-stroke depression, depression and dementia associated with Parkinson's disease, mood and cognitive dysfunctions in Alzheimer's disease and Huntington disease, to name a few. Hence, there is not always a sharp distinction between neurology and psychiatry on a biological basis. The dominance of psychoanalytic theory in the first three quarters of the 20th century has since then been largely replaced by a focus on pharmacology. Despite the shift to a medical model, brain science has not advanced to the point where scientists or clinicians can point to readily discernible pathologic lesions or genetic abnormalities that in and of themselves serve as reliable or predictive biomarkers of a given mental disorder. 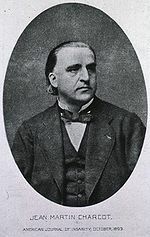 ↑ D. R. Kumar, F. Aslinia, S. H. Yale, an J. J. Mazza, "Jean-Martin Charcot: The Father of Neurology," Clin Med Res. 9, iss. 1(2011): 46–49. Retrieved October 6, 2013. American Board of Medical Specialties (ABMS). 2013. ABMS Guide to Medical Specialties 2013. Elsevier. European Brain and Behaviour Society(EBBS0. 2009. About EBBS. European Brain and Behaviour Society. Retrieved October 2, 2013. European Brain Council (EBC). 2011. CDBE 2010: Backgrounder. European Brain Council. Retrieved October 4, 2013. Hollar, D. W. 2008. Neurology. Pages 1904-1909 in Magill's Medical Guide, Vol. IV. Pasadena: Salem Press. ISBN 9781587653889.
International Brain Research Organization (IBRO). 2013. History. International Brain Research Organization. Retrieved October 2, 2013. Martin, J. B. 2002. The integration of neurology, psychiatry, and neuroscience in the 21st century. The American Journal of Psychiatry 159(5): 695–704. PMID 11986119. Mohamed, W. 2008. History of neuroscience: Arab and Muslim contributions to modern neuroscience. International Brain Research Organization. Retrieved October 2, 2013. Society for Neuroscience (2013). About neuroscience. Society for Neuroscience. Retrieved October 4, 2013. United States Department of Health and Human Services (HHS). 2011 Chapter 2: The fundamentals of mental health and mental illness. Saylor.org. Retrieved October 2, 2013. Wilkins, R. H. 1964. Neurosurgical Classic-XVII: Edwin Smith Surgical Papyrus. Cyber Museum of Neurosurgery. Reprinted from the Journal of Neurosurgery, March 1964, pages 240-244. Retrieved October 2, 2013.. This page was last modified on 22 May 2014, at 21:06.